3M Scotch-Weld DP8005 Acrylic Adhesive is a two-part structural formulation (10:1 mix ratio by volume) that bonds Low Surface Energy plastics (like polyethylene or polypropylene) together or with other materials without surface pretreatment. 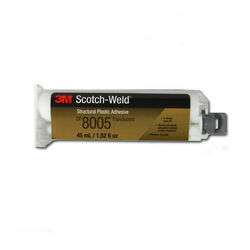 3M's high-strength Scotch-Weld Structural Adhesives are fundamentally load-bearing formulations. Bond strength is often as strong as, or stronger than the materials joined. The 3M Scotch-Weld EPX Plus II 10:1 Mixing Nozzle simultaneously meters, mixes, and dispenses the 3M Scotch-Weld DP8005 and DP8010 Plastic Adhesives. The 10:1 Ratio Nozzles are sold separately, and individually. (Item No. 3M-051115-69043; orange square mixing nozzle). The 3M Scotch-Weld EPX Plus II Applicator is supplied with (1) 1:1 Ratio Plunger and (1) 2:1 Ratio Plunger. Storage. Cartridges should be stored at 4Â°C or below.Shelf life. When stored at the temperature recommendedon the original packaging, this product has a six-monthshelf life from the delivery date. Are you able to provide Mfg CoC ?When is manufacturing date and expiry date ? We do not provide certs, only the manufacturer. Will this weld/glue plastics such as Starboard? Yes, it will adhere to Starboard but it's recommended to use Mechanical Fasteners also. What color is this adhesive? We called and the operator stated it is a light yellow color. How long do have to work with this product? At 73? you will have 3 minutes of working time, and 8-24 hours total cure time, thank you. Only stuff that works on polyethylene. My boat Hull is made out of polyethylene and I had to stick a transducer mounting block to it. This stuff seems to be working just fine. I've been out on the water at high speed and my fish finder is working great. I do advise you to get the mixing needle and plunger. You don't need the gun. You can easily push the plunger with equal pressure to get both tubes to flow evenly. Have everything prepared because you only have two minutes to apply and stick. Keep a light pressure on the materials to be bonded for 24 hours. I used Scotch-Weld to fasten small pieces of star board together. I guess it's one of the few products that works on this material. The product worked well, but (as recommended) I also used screws to be sure. I mixed the 2-part adhesive together straight out of the tube, without buying the (too expensive) recommended 'mixing nozzle'. I just guessed at the 10:1 mix ratio, worked very quickly (+/- 2 minutes). End product will be exposed to elements in marine environment. We'll see how it holds up. This stopped the seepage from a repair on the PolyP gas tank on my van. Just finished a 7500 mile trip around the country with NO leakage. Nice! Finally something that would do the job!I did not use the unique plunger, but squeezed the material our as with regular epoxy adhesive.The working time was LESS THAN A MINUTE from when the material left the tube, NOT after it was mixed! Have never found anything over the counter to glue the two most common Poly plastics together until now. This stuff is the real deal. After trying numerous repairs to my Coleman Crawdad (boat) that I used to float the river, even those recommeded by the manufactuer, I ran across this product. Five years later I still don't have a leak even though the boat's bottom is constantly flexing while in use. I did bolt in a small brace across the cracked area before applying the product on the brace and the crack. I have repurchesed the product since for other problem areas. Best adhesive I've found to adhere a polypropylene encapsulated capacitive sensor to a high density polyethylene bottle. All others tried have failed. Used this adhesive to combine two disks of polypropylene together. The adhesive has been exposed to boling water many times and then cooled repeatedly. So far, so good. Only time will tell if the product will hold up. Rather than replacing the cap to save unused material, it is probably better to just leave the applicator mixing nozzle in place and let the material harden in the nozzle and seal itself. A tiny bit of activator contacting the other part at the opening of the tubes will harden and make it impossible to get the rest of the material out in the future. For long term storage, refrigeration will extend the shelf life. One source at 3M said freezing was OK, but another who seemed more knowledgeable said that refrigeration is good but freezing will damage the catalyst. used to repair hydraulic reservoir (uses Mobil 1 synthetic engine oil). Had tried many other products to no avail. Worked good for me. I was told by the boat manufacturer this would seal a small leak......it did not.